Fly away with Puss in Boots! 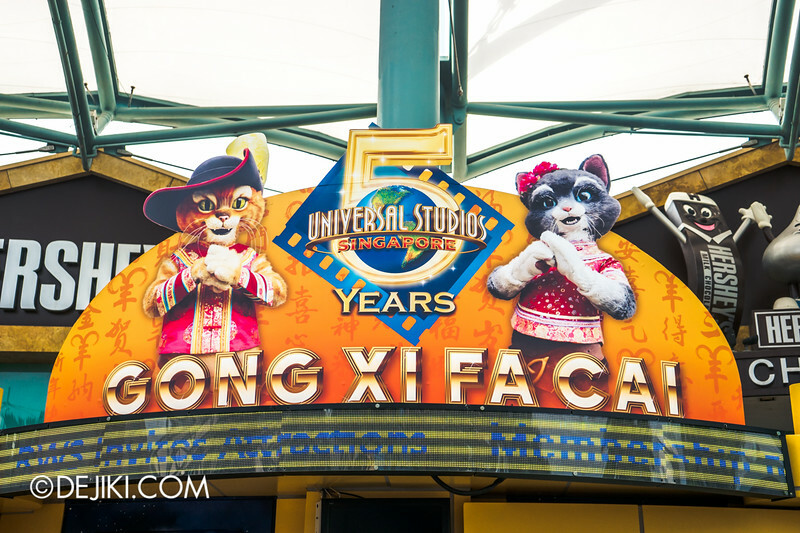 Check out new photos and videos of Universal Studios Singapore‘s upcoming unique attraction – Puss in Boots’ Giant Journey – in this month’s park update! Test cycles for the new Puss in Boots’ Giant Journey ride started sometime in January. 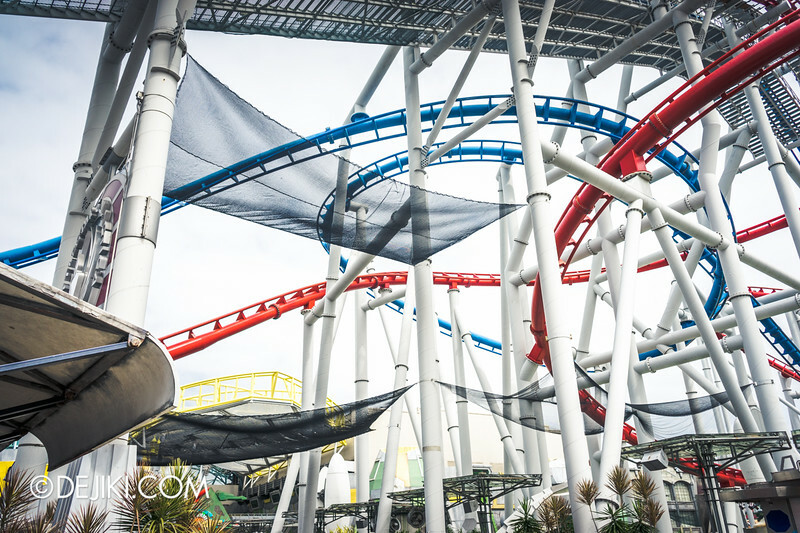 Just a recap: This is the Universal Studios Singapore’s unique (aka “World Premiere”) attraction which uses a ride system by Zamperla. 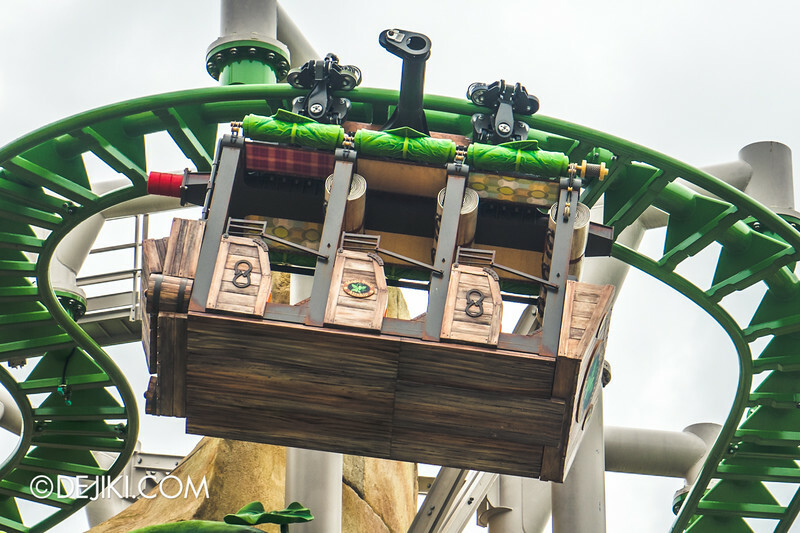 It has a custom track layout, all-new props and scenic elements, and specially designed ride vehicles. 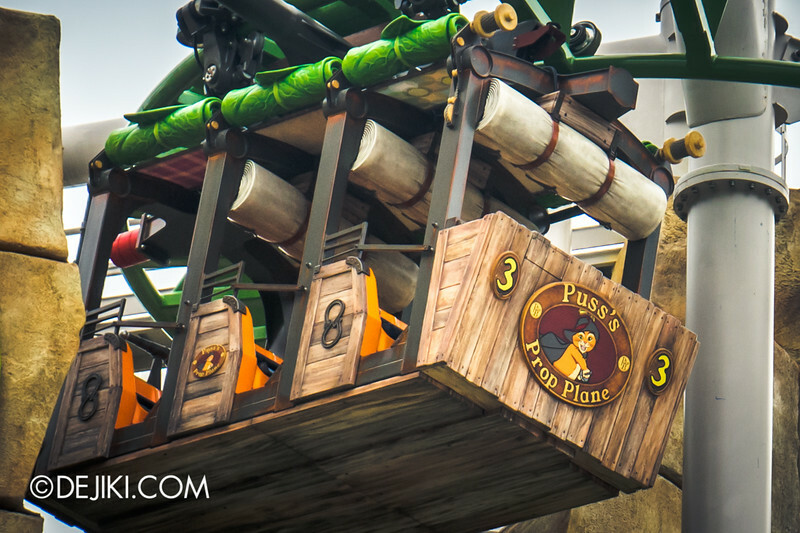 Shaped like wagons that fly in the Far Far Away universe, the suspended ride vehicles ascend from the spiral lift hill and fly out of the tower. 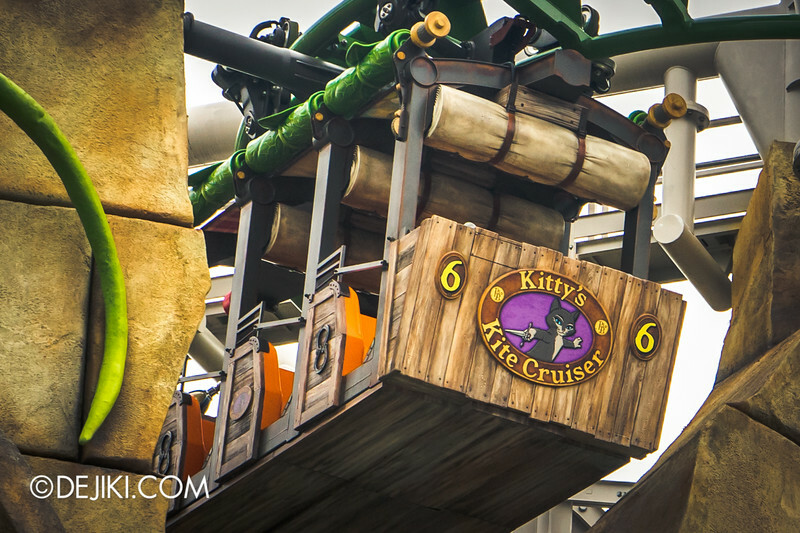 The ride vehicles are themed to characters in the “Puss in Boots” films. Here’s the list of the seven flying vehicles unveiled so far. Which one’s your favourite? 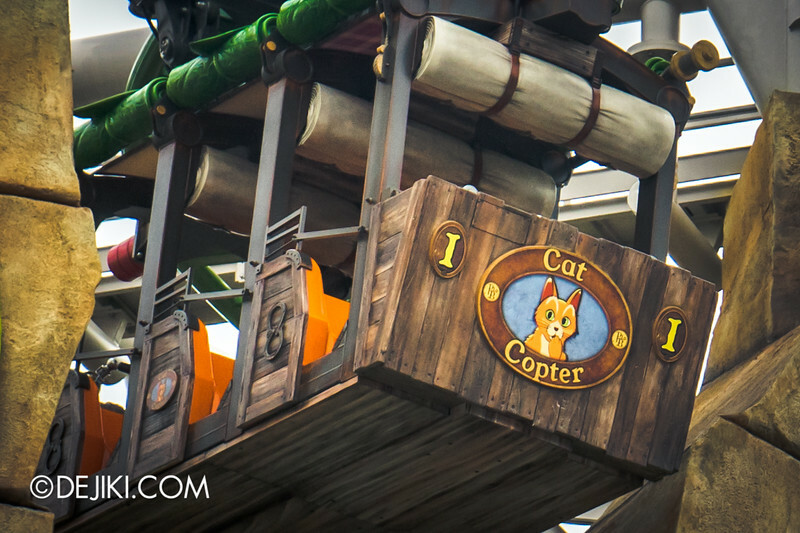 Cat Copter – The awkward one that always go “OOOOOOOhhh”. Gosling Glider – Cute but deadly. Puss’s Prop Plane – The Legend. How could he be #3? 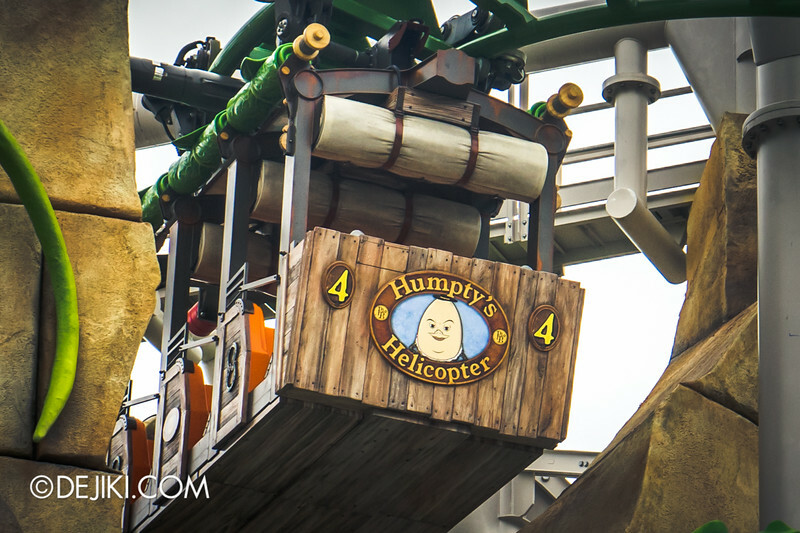 Humpty’s Helicopter – The Legend’s (conniving) best friend. Jack and Jill’s Jalopy – The outlaws’ vehicle of choice. Kitty’s Kite Cruiser – Strike a pose (with a dagger), please. Magic Bean Airship – Travel to the highlands without climbing. Initially, the test cycles were sporadic. Towards late January, it was more regular and all seven vehicles had their share of flight time. The ride facade is also complete and looks rather fine. 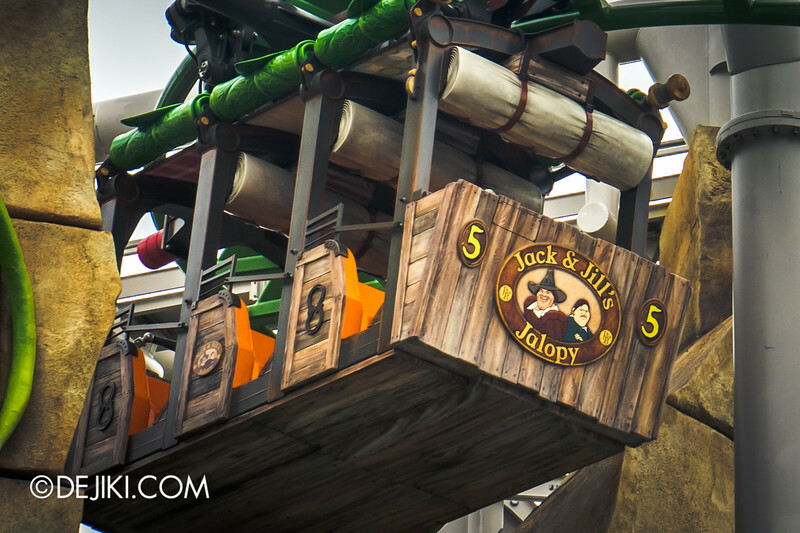 I have also seen an overview of the entire attraction – I can’t share a photos of either and I will hold my comments until the ride is ready for willing test subjects such as myself. Show effects, such as lighting and animated props, were also activated as part of technical rehearsals. 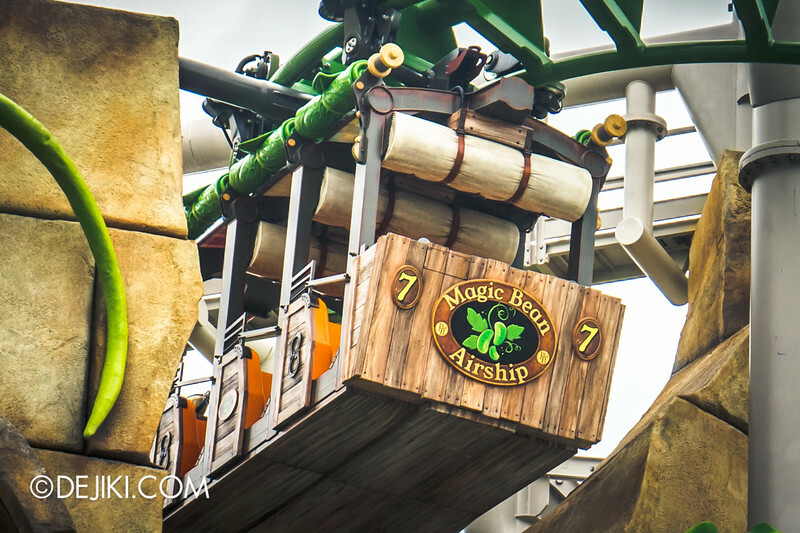 Back to the ride vehicle, which has capacity for up to 9 guests: It has many cute decorative details in its design. Giant rolled leaves for window shades (or protection against giant beasts). Bundles of emergency gliders above each row of seats. Quilted ceiling. 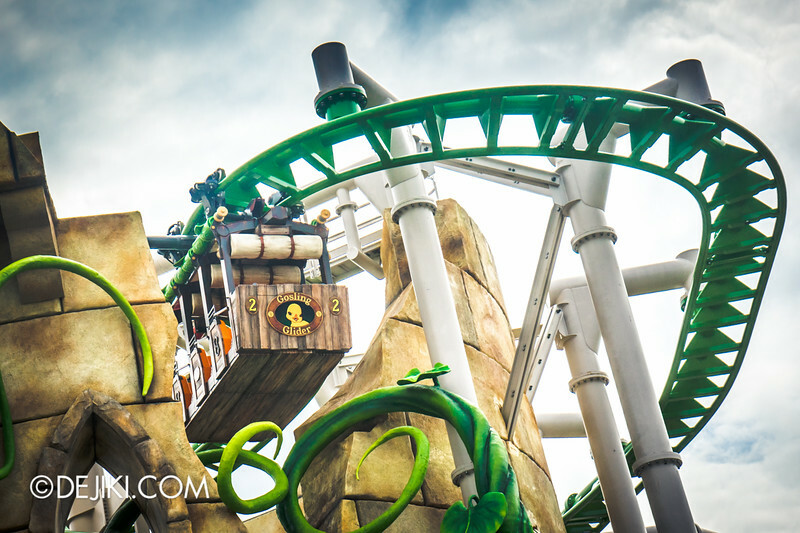 Two horseshoes joined together to form an “8” shape, at both sides of the ride vehicle. 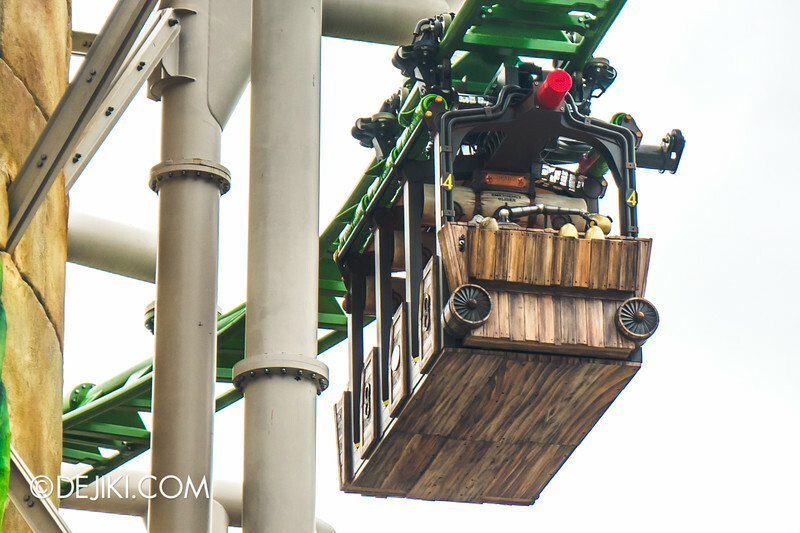 You might’ve noticed that the ride vehicle has bars on its right side. Most likely both boarding and disembarking would be on the left. Also, there is a protruding bar on the right side – it latches onto the rotating spiral lift – it’s more obvious in the photo below. At the back, it has a compartment for storing golden eggs – and there’s already a few of them! And these airships are powered by tiny turbines – running on magic more than engineering. 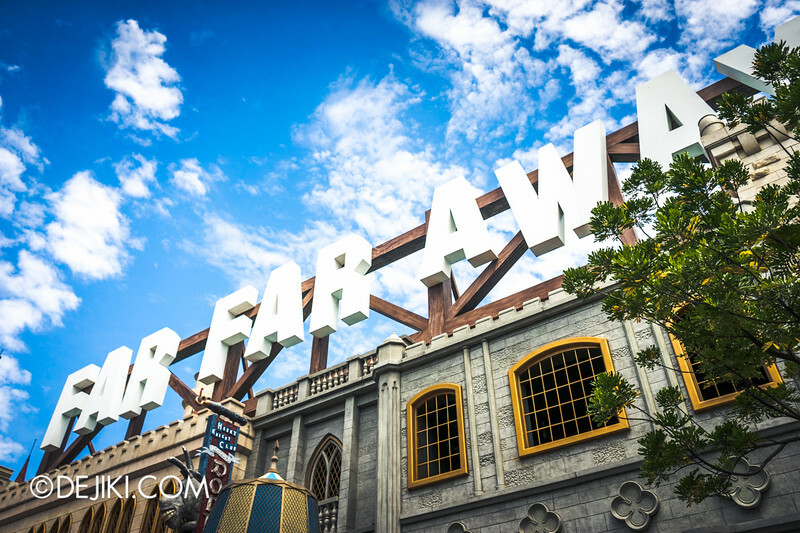 Universal Studios Singapore’s all-new, world-exclusive attraction! In the video, look out for some moving animatronics, such as the Giant Goose’s head (0:49) and Gosling (1:03). Testing of both attractions are still ongoing. According to fellow park fans, both trains consistently look faster. The telltale signs are at track segments where the trains usually slow down – they hardly do anymore. The ride times are shorter than before. And oh, the trains were also recently numbered. Same as before – just 1 and 2 – for each track. 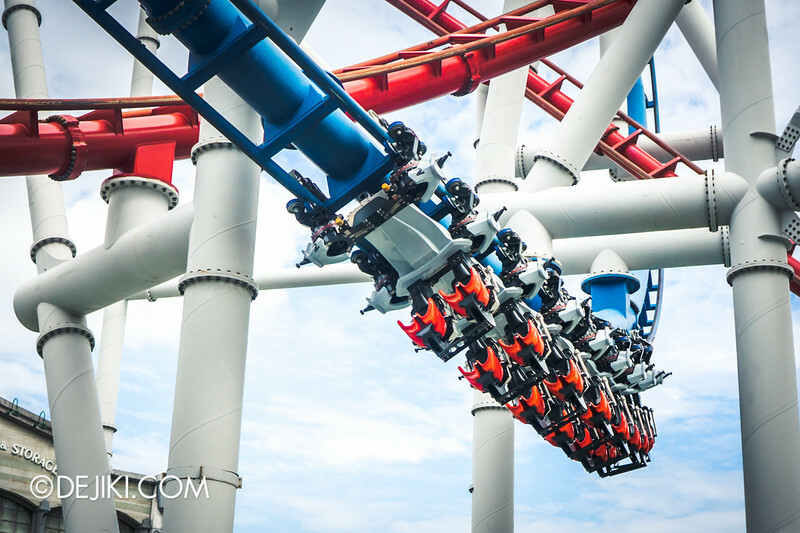 It’s likely that the park is ramping up on its test cycles to speed up re-certification, with cycles happening very regularly with shorter intervals. The timeline to reopen the ride is getting tight. HUMAN (Red) was seen to have two trains taking turns on the tracks. If the park needs test subjects, I’d be first in line to sign up. 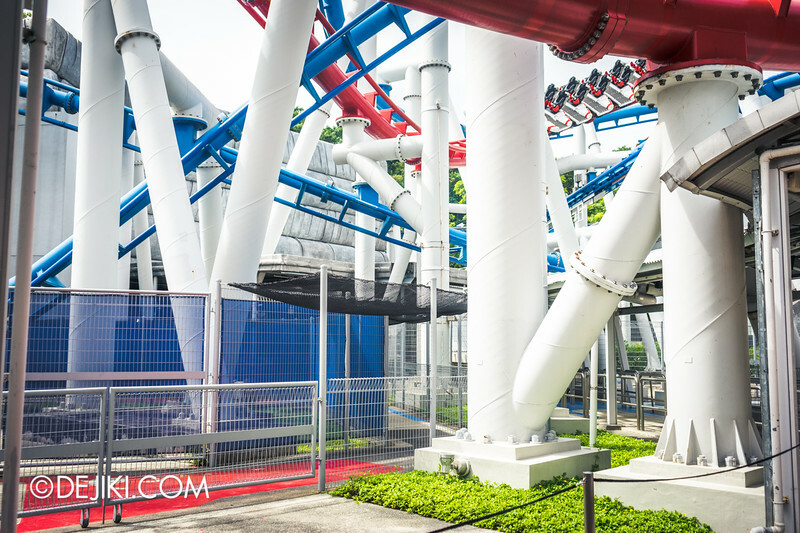 Galactica PX (the ride exit store for both rides) appears to be refurbished for the ride’s reopening. 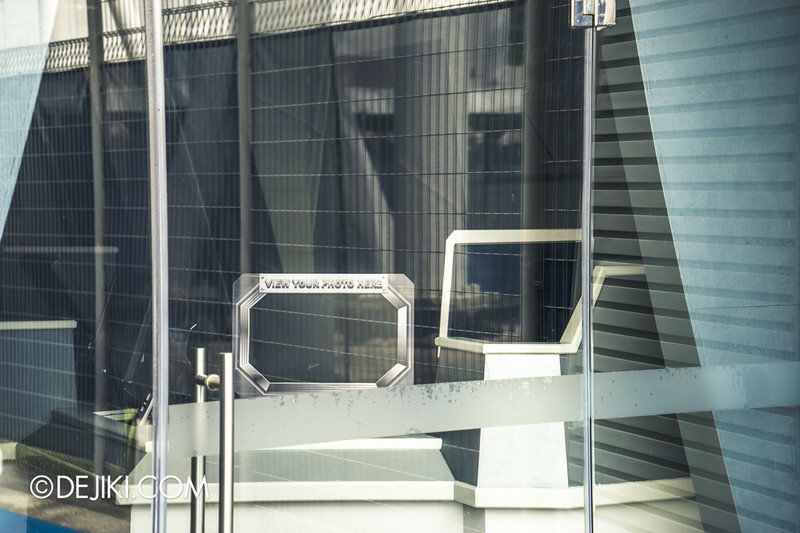 And welcome back to Sci-Fi City – now filled with The Amazing Nets of Galactica. 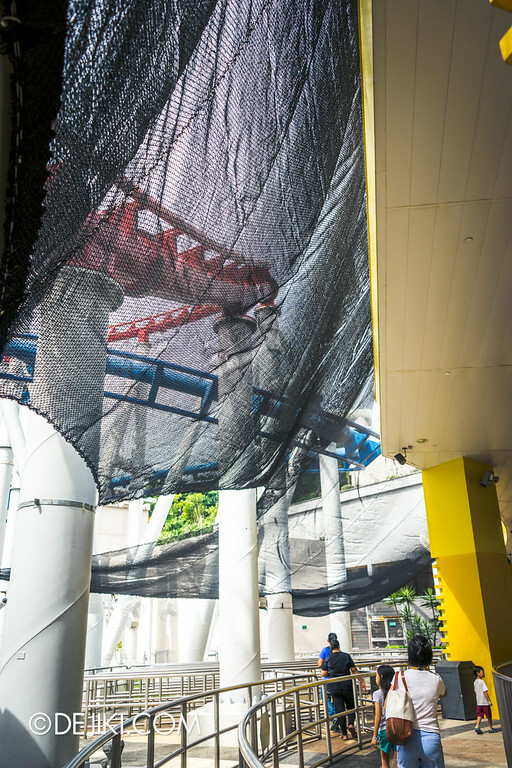 For guests’ safety, there are now more nets installed all over the area below BSG’s tracks. The coverage is much more extensive than before. 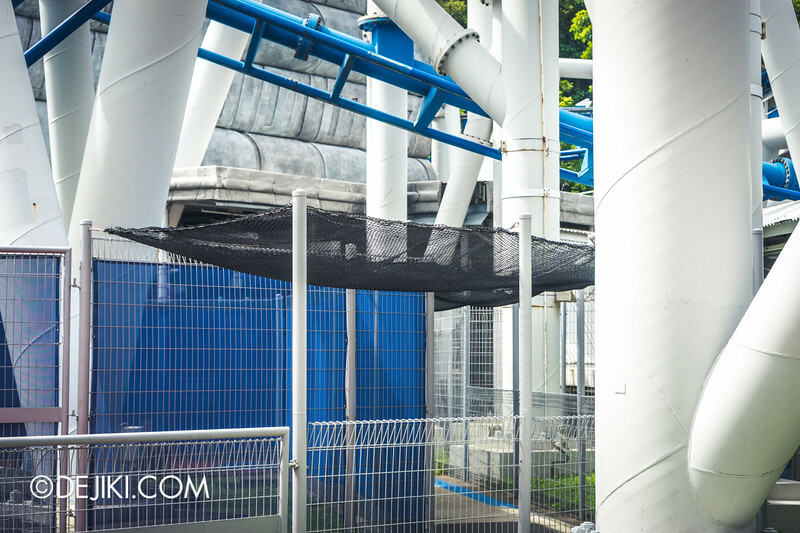 The side of the Accelerator ride building that faces BSG is almost entirely draped with black nets. 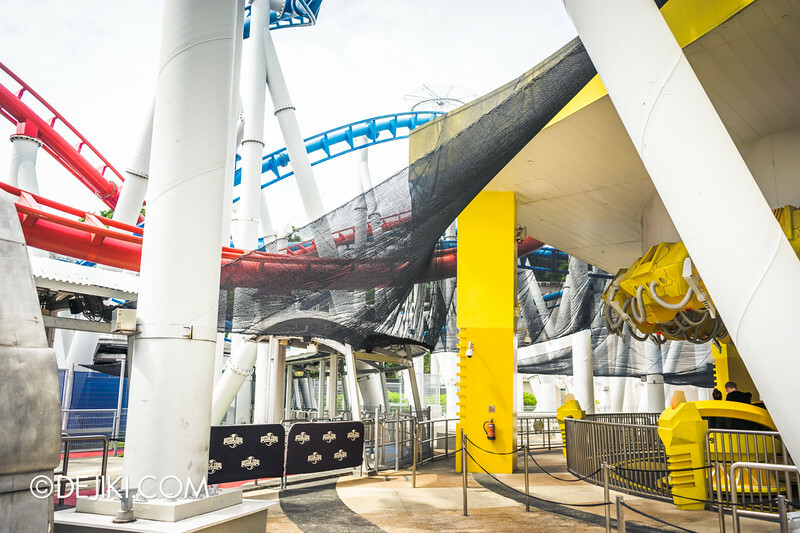 Even the ride exit path (which is open air) is getting a canopy of nets. I’m sure the park’s old-timers would know that sometimes it would rain money (yes!) under the tracks. While it might seem like a windfall, it’s actually quite painful to be pelted by coins. If the fallen objects are larger, it’s very dangerous. So remember – always empty your pockets and store all loose items in the lockers when you go on rollercoasters at the park! A rather dazzling arch for this festive season. 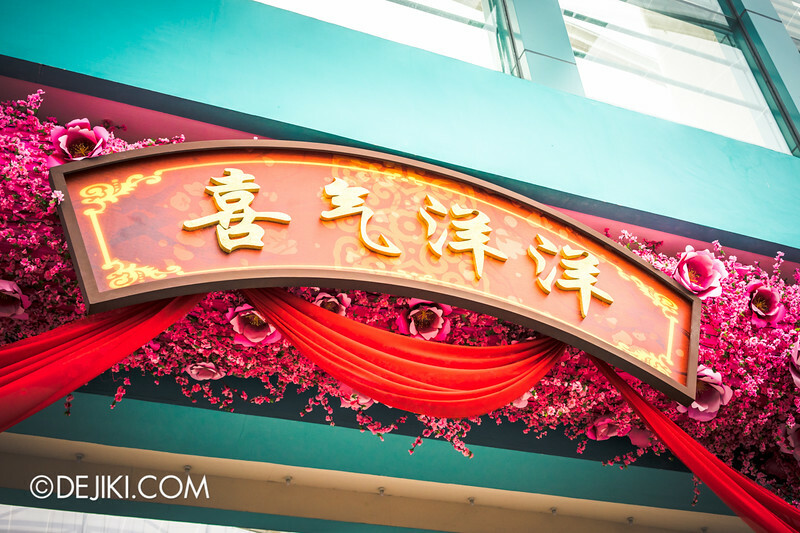 The board above the arch reads 喜气洋洋 – literally full of joy. The arch has lights embedded – It’ll shine bright and pink in the evening. Mega Boombox from the Countdown and 2015 resort employee parties is finally gone, and replaced with this display. It’s a gigantic window thing with a goat (for the Year of the Goat), in the style of traditional Chinese paper cutting art. If you can’t find them at the park, you can get a peek (at the park entrance) of what Puss in Boots and Kitty Softpaws are wearing this season. Very bold fashion statements – Cavalier hat with traditional chinese vest? And are those vambraces in the same style? Are you still wearing boots with that look, Puss? 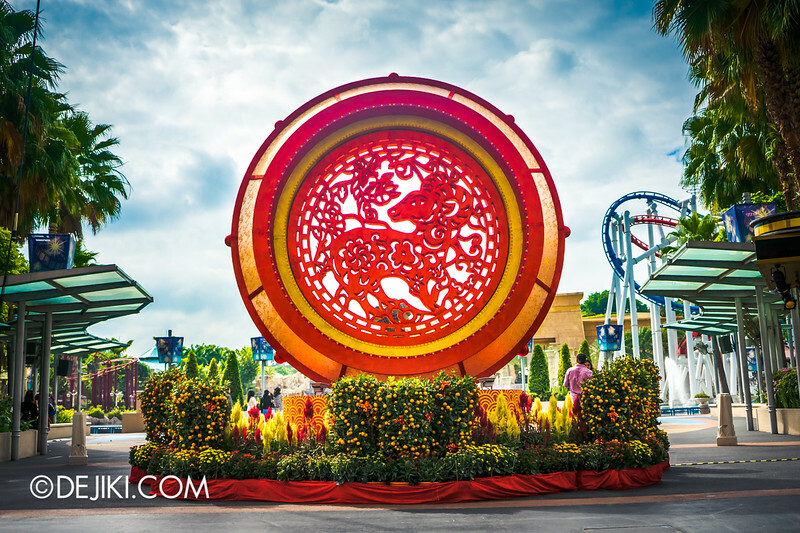 Anyway, don’t miss the Universal Studios Singapore 5th Anniversary logo. 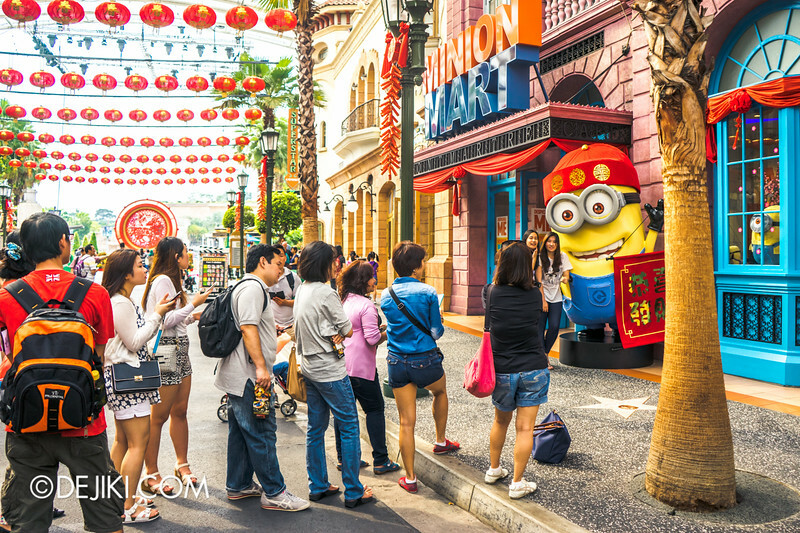 The Giant Minion’s not letting anyone steal his limelight, though. From 19 to 21 Feb 2015, the park’s opening hours will be extended. USS will be open from 10AM to 9PM. 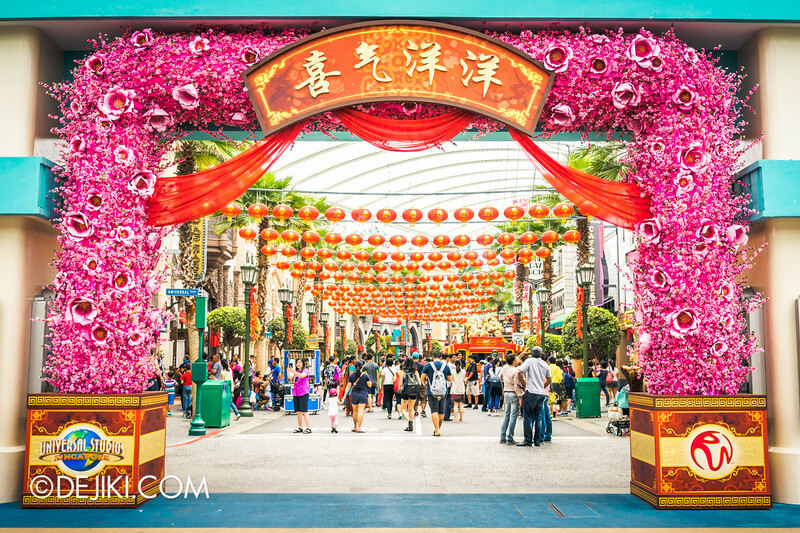 Apart from festive costumes for some meet-and-greet characters, there isn’t much fanfare this year compared to 2014 – there were Lo-Hei Lunar New Year Dinner event thing and red packet giveaways last year. 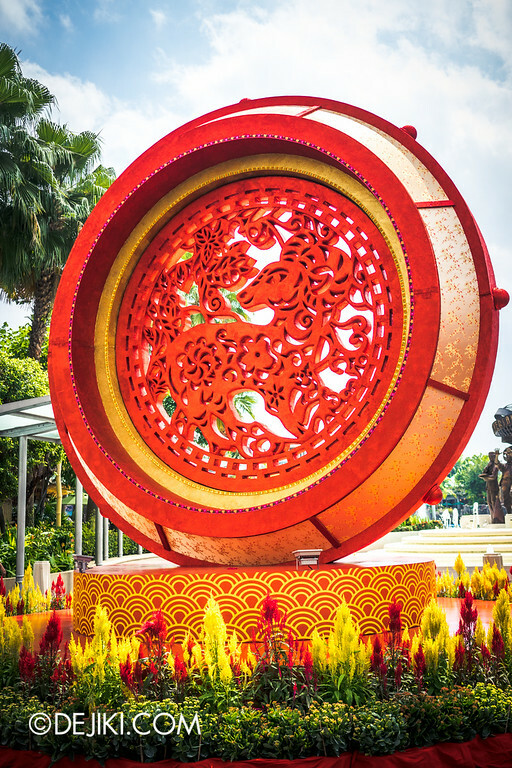 I’ll update this post if there’re any notable Lunar New Year happenings at the park. Until then, let me know what you think about the updates on Puss in Boots’ Giant Journey! So when the BSG rides? There will be two standalone meet and greet sessions happening only at 11am and 4pm daily, outside the potion shop (Where the “WANTED” poster is). As for the street entertainment “The Dance for The Magic Beans”, the shows will still be conducted, but there will NOT be any meet and greet sessions on it. Summary: Meet and greet sessions will only happen at 11am and 4pm daily – standalone sessions. Important! Session times are subjected to change. Do ask the star guides to confirm these session timings, especially when the park operating hours is not the usual 10am to 7pm. I am considering renewing my annual pass. Zezima, did you find out if there are new characters (or returning ones, considering the removal of Fairy Godmother, Rick and Evelyn, Ardeth Bay, etc. last year)? Not at the moment as far as I know of. The newest mascot for now is Kitty Softpaws. There are no new characters during CNY period as well. The existing ones (Puss In Boots, Kitty Softpaws, Woody and Winnie Woodpecker) will be wearing their CNY costumes during this period. Oh one more thing! If you are considering to sign up / renew the attraction pass, there is a promotion going on right now. This promotion is valid from 01 Feb 2015 to 30 Apr 2015. There are a total of 5 collection periods throughout the whole year. Basically you redeem your gifts during the collection period. FYI – The redemption is only eligible for signups / renewals that are processed within this promotion period. Its a little late but PIB giant journey is much faster than you think. Great post as usual! 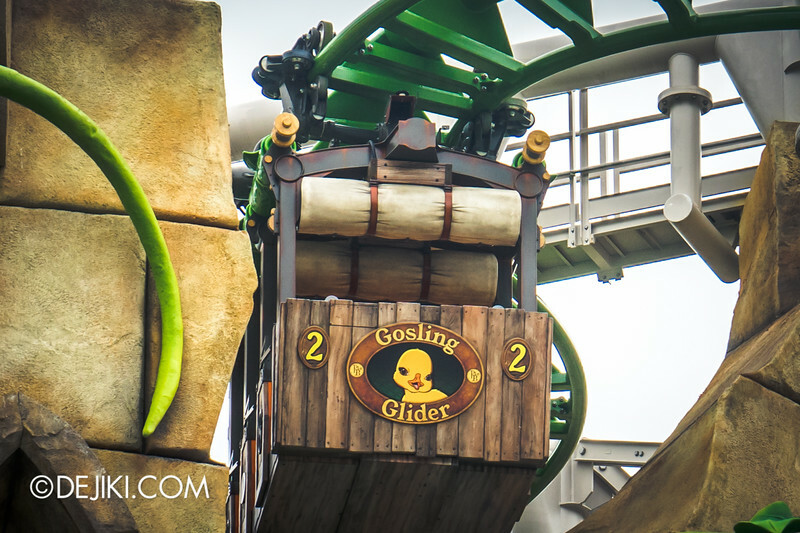 I’m just wondering if the Mummy ride at USS is still closed? That’s right. Revenge of the Mummy is currently closed. According to the park, it is “annual maintenance”. Nope! I went just last week and it was open! Thanks for the post and the heads up. 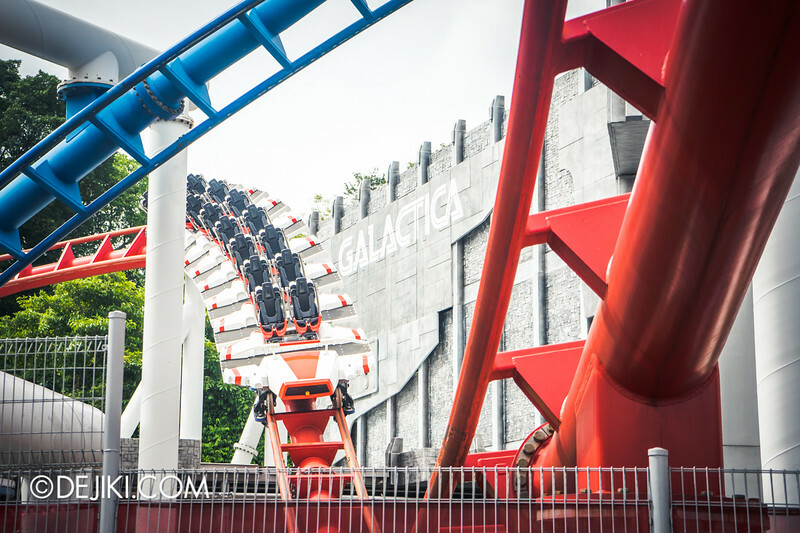 Cant wait for galactica to open!!! Btw can i ask, where and how do u sign up as a test subject? Do you guys have any pictures of INSIDE the Galactica stations? The inside queues? Are there preshow videos? I can’t seem to find any anywhere. when will the batte star galatica ride open any idea? I am visiting USS in March 2015, I have been twice before. I am slightly disappointed at the moment that the Battlestar Galactica is still not open, and now the Revenge of the Mummy is closed for annual maintenance. I appreciate that maintenance is important. Any idea on when these might be open? any idea on halloween horror nights 5 USS? i mean any thing that you know of like themes and stuff like that… THX. any idea on Halloween horror nights for this year? i mean any sort of idea on the themes and stuff like that? 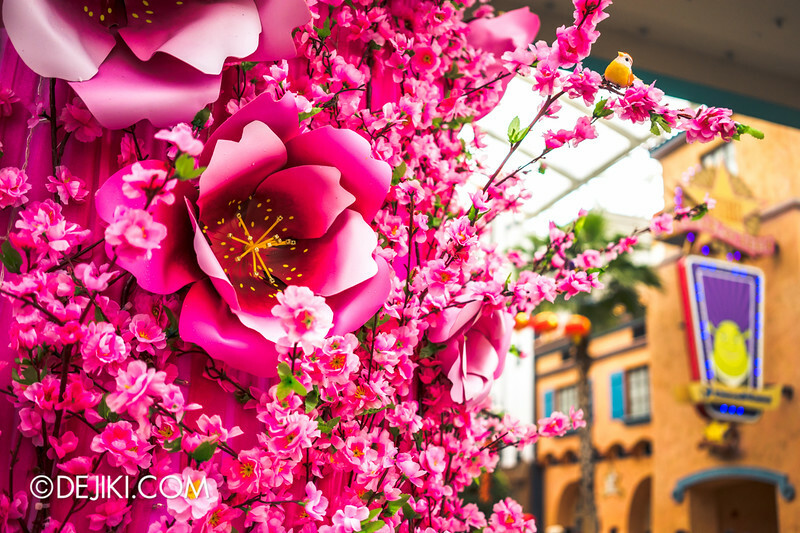 I am visiting USS on 15th of March 2015,which is the week of school holiday started. So I am wondering is the Battlestar Galatica will be open on this school holiday? And any idea on when is Revenge of the Mummy ride re-open again? Unfortunately the park has not announced the reopening schedule for BSG. I heard that it is unlikely to be ready in time for March holidays. Revenge of the Mummy has reopened. hi there, will bsg open in early may? ?